The Scottish Premiership season commences this weekend and fans can expect to see a swarm of new faces run out for their side for the first time. It has been a busy period of transfer activity as teams look to strengthen and build on their previous campaign. With gaps to fill, many clubs have been looking outside of the Scottish border for new talent. Alongside club stalwarts and players familiar with the Scottish game, which players will help shape the season? Celtic built their title-winning side around a solid foundation at the back last season. Virgil van Dijk and Jason Denayer were at the heart of a defence that kept 22 clean sheets in the league. With the latter returning to parent club Manchester City, manager Ronny Deila has been quick to find a replacement. 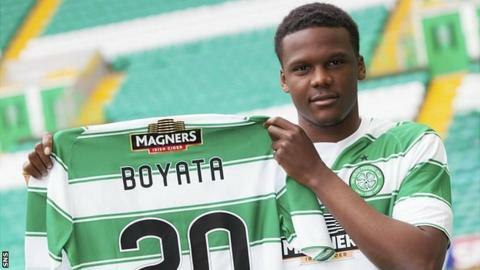 Dedryck Boyata signed a four-year contract this summer, ending a nine-year stay at Manchester City and the 24-year-old has already looked settled among his new team-mates. A goal on his competitive debut against Stjarnan, followed with the winner on Thursday, helped Celtic secure a 1-0 first leg lead over Qarabag. Celtic will be looking for this form to continue as they chase a fifth consecutive title. Last season, Aberdeen had their best league campaign since the 1993-94 season as they secured second place. This season, they will be looking to improve on the promising strides they have taken under Derek McInnes. The Dons have strength in depth in most departments, but the acquisition of goalkeeper Danny Ward from Liverpool on a season-long loan looks to have been a smart piece of business. McInnes deployed both Jamie Langfield, 35, and Scott Brown, 30, between the sticks last season, but the early indications seem to point to Ward being given the opportunity to stake a claim to be the club's number one this season. Impressive displays in the Europa League qualifiers have strengthened the 22-year-old Welshman's position and he could be a key factor if the Dons are to push Celtic all the way in this season's title race. Nadir Ciftci's £1.5m departure to Celtic this summer has left Dundee United boss Jackie McNamara with a position to fill in his forward line. McNamara will be hoping that Croatia Under-21 cap Darko Bodul will be the man to do the job. At 26, Bodul has plenty of experience throughout Europe. Beginning his career in his native Austria with First Vienna, Bodul has also had spells with Dutch sides Heerenveen, Ajax and Sparta Rotterdam, as well as stints with Nacional of Portugal, Austrians Sturm Graz and Danish outfit Odense. He left Austrian Bundesliga side Rheindorf Altach at the end of last season. Bodul made his pre-season debut in a United shirt during the 2-1 defeat by Queens Park Rangers, coming on as a second-half substitute before starting in the 1-0 friendly defeat by Watford, lasting an hour before being replaced. McNamara described his new signing as ''technically gifted, skilful and a penalty box goal scorer". With some impressive teams on his CV and a two-year contract, United will hope to see the best of Bodul in the coming season. He may have the most famous name in Scottish football, but Dutchman Rodney Sneijder wants to be his own man at Dundee United. The younger brother of Galatasaray midfielder Wesley, Rodney was signed on a two-year deal after his release by Almere City in his homeland. It marks the first time that the 24-year-old midfielder has played for a club outside of the Netherlands. Having begun his career at Ajax, Sneijder will be looking to kick-start his time in Scottish football when the season gets under way. With United looking to rebuild after the recent departures of Gary Mackay-Stevens and Stuart Armstrong to Celtic, it would appear that he will likely get the opportunity to do so. Sneijder may get his first chance on the opening weekend as his side face Aberdeen at Tannadice this Sunday. After winning the Championship last season, Hearts will be determined to re-establish themselves as a top-flight club after their season in the second tier. Robbie Neilson has conducted a squad overhaul as they look to build upon their title success. The conclusion of Genero Zeefuik's loan spell from Groningen has left a void up front that Neilson will be looking for Juanma Delgado to occupy. The 24-year-old Spaniard joins from Greek Super League outfit Kalloni on a three-year contract. At 6ft 2in, the former Levante youth player will have a presence in the forward line that Neilson will require to meet his ambitions of finishing in the top six this season. He is described by his new manager as "a good player, technically very good, great in the air and has good link-up play - and he's a great character".